One of the biggest changes in Blender over the last two years has been major changes and reorganization of its user interface. 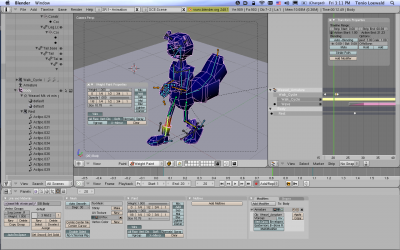 The goal was to address Blender’s glaring usability issues, and indeed many of them have been addressed. Yet Blender remains a dauntingly difficult program to use, and — worse — a difficult program to remember how to use. I’d say that to me (and I am hardly an expert user of any) Blender is now still somewhat harder to use and more disorganized than, say, Modo (I have Modo 601) or Cinema 4D (I have v11 XL) but that’s not saying much. All serious 3D applications, and Blender unquestionably qualifies as a serious 3D application, are plagued by the intrinsic complexity of what they’re trying to do, combined with a lack of agreement on the “right way to do things”, and the fact that real technical improvements are constantly being made in 3D graphics, leading to proliferation of overlapping tools and terminology (consider that there are multiple implementations of subdivision surfaces — such as Catmull-Clarke and Stam-Loop — and it’s important for a 3D program to support as many as possible if it’s to be compatible with other 3D programs. Similarly, there are many different tools for modeling organic objects and curved surfaces, including NURBS, subdivision surfaces, deformation lattices, and multiple approaches to sculpting (including voxels and displacement). 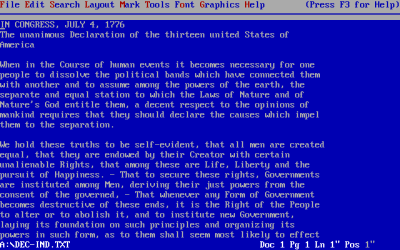 Wordperfect 5.1 for DOS (image from wikimedia.org). Note the F3 for help (F1 was more of a “standard”). 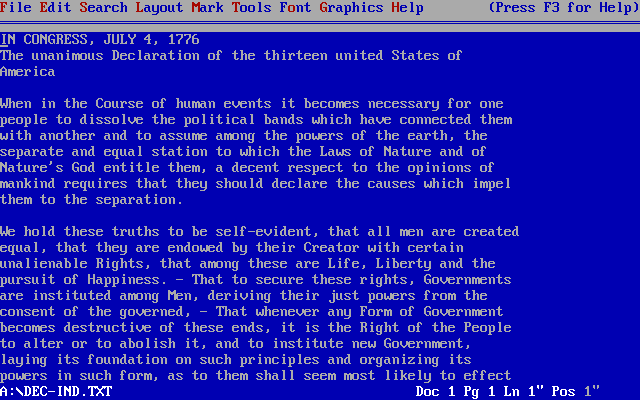 While it has an Edit menu, “cut and paste” weren’t supported (it had block and move functions instead). And bold was F6 rather than ctrl-B. And then let’s return for a moment to the point that — unlike with word-processing — almost every aspect of 3D technology is constantly churning. With word-processors and even page layout programs there have been some technical improvements to be sure (e.g. typefaces have become more sophisticated with things like multiple master fonts and automatic ligatures, there’s Unicode of course, and compositing has improved markedly) but these have been relatively simple changes conceptually, and in general they have just made things easier (e.g. instead of having to render a drop shadow in Photoshop, export it as EPS, and then embed a reference to it in Quark XPress, you can now perform the entire operation in a click or two in your page layout program or word-processor). Contrast this with the world of 3D which has seen major new technologies emerge in pretty much every piece of core functionality from modeling to rigging to texture-mapping to lighting to rendering — and all these different technologies have to live side-by-side, inter-operate, and somehow fit into a single user interface. As you’ll discover if you visit Blender’s website right now, Blender is now 20 years old, and that means it has 20 years worth of functionality clogging up its user interface. 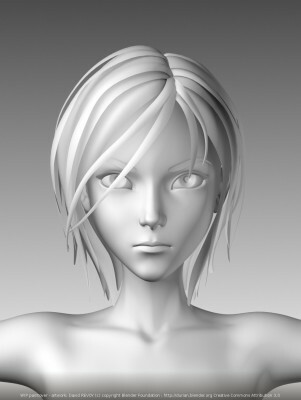 It supports NURBS and subdivision surfaces and multi-resolution displacement sculpting. 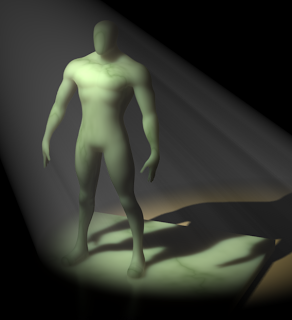 Similarly it has support for rigging using bone envelopes, vertex-painting, and heat-mapping. It has three built-in renderers. 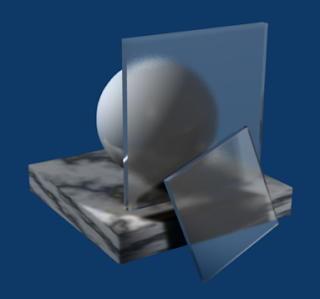 It has two different node-based shader architectures (or is it three?). I’m sure you’re getting the picture. Blender remains unusually bad at a fundamental level because it refuses to adhere to such cross-application conventions as do exist. The most hilarious example is left-click to select. It’s almost impossible to find another application anywhere that uses left-click for something other than selection (unless there is no concept of selection at all). It’s simply bizarre. What’s worse, left click is used to position the 3d “cursor” object — which is actually a very clever concept — except that it’s a far less common operation than simple selection, and doing it by accident is really annoying. 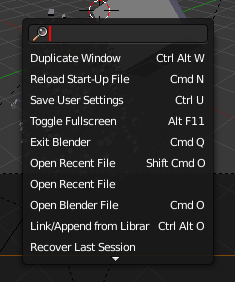 Now I need to note that Blender does allow you to make left-click into select as a preference, but the program really doesn’t work properly in this mode (and you need to reset the preference when you upgrade Blender) so that’s not a satisfying solution. 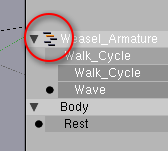 Just to give you one example: there’s a shortcut in Blender to allow you to “lasso select” using ctrl+left-mouse (why left-mouse when selection is normally with the right mouse?) — this becomes ctrl+right-mouse if you’ve set left-click to select. What I want is to select stuff with the left mouse button. Not flip a ridiculous set of defaults and create a different ridiculous set of defaults. On the whole, I end up sticking with right-mouse to select simply because it means not having to reverse engineer every tutorial I find. 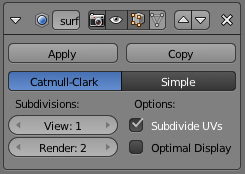 If it were up to me, selecting something (with the left mouse button) would also, by default, position the cursor at the selected object’s local origin (sometimes referred to as its “pivot”). You could explicitly position the cursor with the right mouse button (or perhaps setting the cursor could be a mode or tool), and there would also be an option to lock the cursor (many 3d programs effectively have a “cursor” locked at the origin). This would actually maximize the conceptual mapping between the 3d cursor and the text cursor — left clicking sets your insertion point – and not compromise users’ familiarity with programs other than Blender. 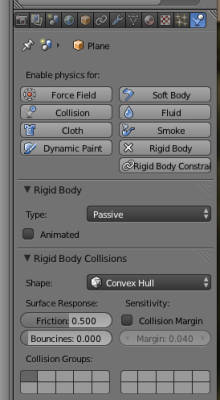 There’s a small + widget for disclosing the Tool Shelf and Properties panels in the 3D viewport. Once you’ve toggled a panel on, there’s no widget to make it go away. 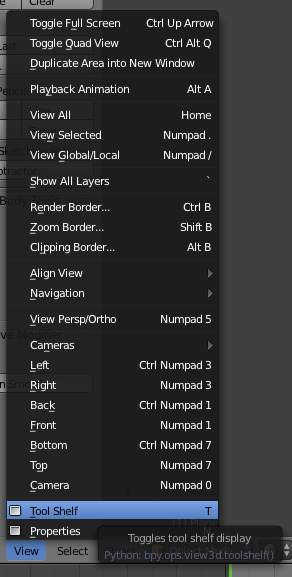 So you either need to size the panel down to zero or learn the keyboard shortcuts (you won’t learn the keyboard shortcut by hovering over the original widget though). 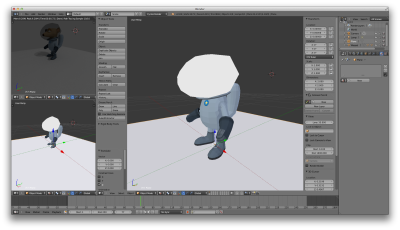 Blender’s improved user interface — and it is definitely improved! — has two more major annoyances from my point of view. First, contextual tool panes have been added to the 3D view (which is great) but the process of showing them and hiding them is asymmetric. To disclose them you click on a little + widget — which then disappears. To hide them you either need to learn the keyboard shortcut, or use the mouse to scale them down to nothing (which causes the little + widget to reappear). 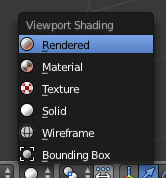 To switch the viewport mode to a rendered preview, first you need to switch renderers. Then you’ll need to change the viewport shading mode to Rendered. The render preview looks terrific but no UI affordances show up except for the damn cursor. Second, with the advent of the new Cycles renderer, to get a live-rendered viewport you need to switch to the Cycles renderer (one step) and then in a completely different place you need to set the viewport mode to Rendered. For your trouble you are rewarded with a wonderful live-rendered view that gives you no UI affordances (e.g. you can’t tell what’s selected) but remains live for editing purposes. Ugh. So to make this workable, you then need to create a new viewport and tweak its settings. 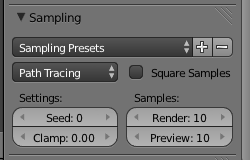 To alter the render preview quality you’ll need to dive deep into the render tab to Sampling (which is not only near the bottom, but collapsed by default). Finally, to modify the quality of Cycles renders — and spent quite a bit of time googling to figure this out — you need to delve deep into the rendering panel and — slightly hilarious — the place where you determine how many samples to obtain for a render is the only place I know of in Blender’s interface where the preview settings are at the bottom and the final render settings are at the top. If you’re used to Blender’s “conventions” everywhere else (e.g. subdivision settings) it’s always the other way around. 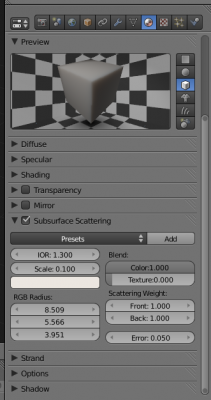 New functionality is being added to Blender with a much higher standard of usability than the older stuff. These are most of the first order problems in Blender today (as of 2.69). Clutter and ambiguity are also first order problems — I’d suggest that a lot of that could be improved simply be making a decision as to which slabs of functionality to hide by default. 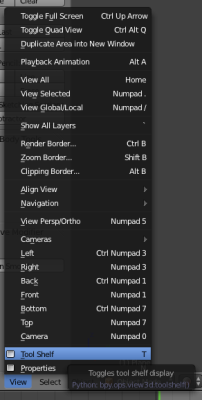 I hope we can some day get to second order issues, but on the positive side most of the new stuff getting added to Blender seems to have a much higher standard of usability than older features. E.g. 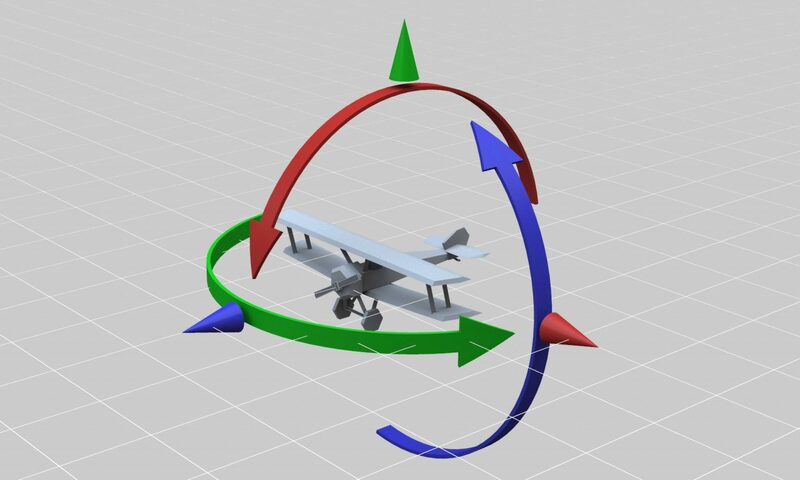 to do a physics simulation you simply click on the Dynamics tab, select your objects, assign them some properties (e.g. 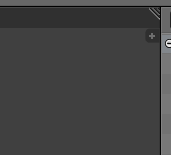 passive rigidbody) and then click the play button in the timeline panel and it just works. More of that please! 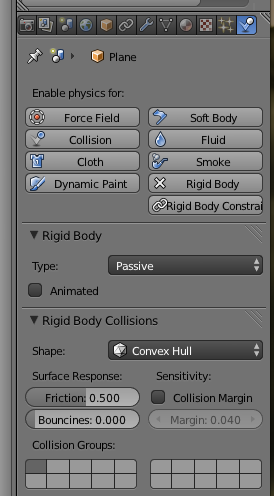 Similarly, the node-based material system associated with Cycles is very easy to work with (indeed, you don’t really need to use the nodes at all) although right now it’s missing a lot of functionality. Blender 2.5 Alpha 0 is out and ready for download. The servers seem to be pretty much hammered right now. 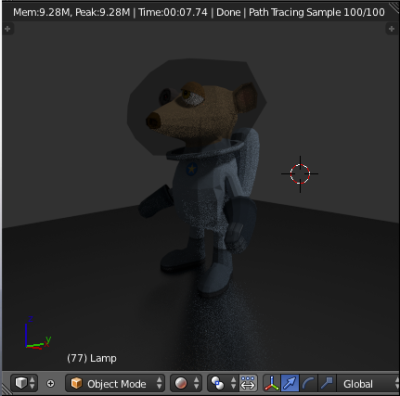 While the “Alpha 0” part may not inspire a huge amount of confidence, Blender in general is a pretty solid piece of software, so it seems reasonable to expect it not to blow up in your face. Much better UI organization (and appearance). Properties are logically and consistently presented. Lots of context-sensitive controls and functionality. The spacebar menu now lets you quickly search for commands. Much easier to find commands (the “spacebar” menu now lets you search for commands — so you can get to any command by hitting space and then typing the first few letters of its name). Tool buttons have tooltips showing you the tools keyboard shortcut and Python equivalent (unfortunately it looks like it’s the Python equivalent that’s used for mapping keyboard shortcuts, which makes sense from an engineering point of view, but isn’t very user-friendly). According to the release notes, there’s also cloth and smoke simulation and improved particles (I’d never used Blender’s particles before and it’s a testament to how much things have improved that I was able to get particles up and running in a few moments without looking at any documentation or tutorials). My experience of Blender 2.5 thus far (pre-alpha) is that it’s quite stable and a lot more usable. The new version includes a 64-bit OS X version (yay!). Of course by trying to keep my list short, I either left out a things (we’ll get to the most important item in a sec) or left a bunch of stuff as a corollary. There’s no point being usable if you aren’t useful. This should be obvious but it needs to be said. 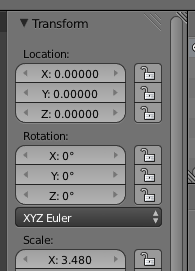 Blender obeys the zeroth law (in spades! ), and it’s free and open source, making it sad that it disobeys laws 1 to 11. Visibility (as stated) implies reduce clutter, organize things sensibly, use visual hierarchies. If I put each of these in as a law in I’d have 50 or more laws and no-one would read to the end of the list. This would make the list less usable. A classic example of the Visibility law in action is that if you try to say delete something in a good program, the dialog’s buttons will be captioned “Delete” and “Cancel” (or similar) rather than “Yes”, “No”, “Abort”, “Retry” or “Fail”. Putting the most important information in the first place someone will look is a corollary of the Visibility law.